In recent years, the slogan about N’Djaména becoming the ‘vitrine de l’Afrique’ has been a central theme in the propaganda of Déby for assuring his position in Central Africa. The transformation, modernization, and beautification of the city have been among the priorities of the government, which seeks to transform the capital into an attractive hub for international allies in the region. The voices from the ground in Chadian society, however, do not seem to be living in the same city that seeks to attract business and put on a display of opulence. Looking at the recent developments of Chadian history, it is not too difficult to notice that the international role of Chad and its internal politics follow very different paths. While the Chadian government is considered by the other countries of the region and by its Western allies as a reliable piece on the chessboard of regional security, its attitude on the internal level runs in the opposite direction. In a country that is in fact in a state of never-ending crisis, in which delays in salary payments and technical issues with Internet connections are a daily occurrence, it appears that the citizens are paying the heaviest price for the beautification of the ‘vitrine de l’Afrique’. Since 2015, N’Djaména has been shaken by a wave of youth protests led by the students who are, as in many countries all over the world, the keystone of critics of the government and in the frontline of citizen mobilization. The anger of the university students towards the government exploded after delays in the delivery of study funding. In 2015 this funding amounted to a monthly allowance of 30,000 FCFA (about 50 €)—not a large sum of money but enough for students to live on. The stipend had been 25,000 FCFA, but since 2012—following student lobbying—5,000 FCFA had been added to compensate for the expensive living conditions in Chad. In August 2015, student protests erupted, as students were claiming an outstanding payment of six to nine months’ stipend. To reinforce their protest, the students went on strike. They also planned a demonstration. The national student organization Union National des Etudiants Tchadiens (UNET) took the lead. A meeting to discuss the difficult situation of the students was held on 12 August 2016 outside the university campus, despite an interdiction by the authorities. The students were arrested the same day. The group (about 30 students) was released one day later, except for the president of UNET, Nadjo Kaina. He found himself accused of agitation and preparation of a movement against the government. He should have been adjudged on 21 August, but the trial was postponed. During the court hearing on 21 August, UNET representatives were not permitted access. According to the president of UNET’s Doba section, the spokesperson for UNET on the case, there was simply not enough evidence. Nevertheless, a request for a temporary release was not granted. Kaina was eventually released on 4 September of the same year. The helmet protest of 2015: just a trivial case? The heavy repression by the police of this demonstration is not surprising. Early the same year in March, the government had to face another intense—and perhaps unexpected—youth protest, under the circumstances of the imposition of a new law requiring the wearing of helmets for motorbike riders. What may have appeared to an observer from outside as a trivial case became a major protest that brought the youth onto the streets of N’Djaména for days, a protest that made visible in the most tragic way the potential for violence that lies at the heart of the Chadian state. 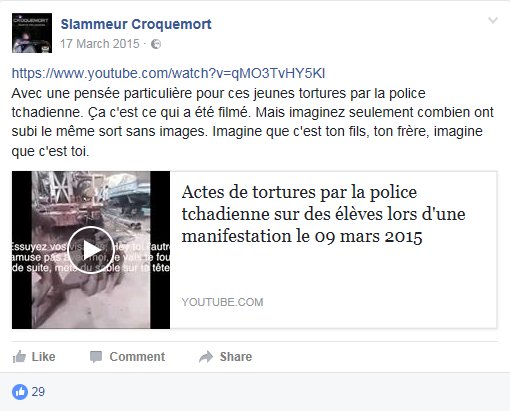 The 9 March 2015 protest against the law requiring helmets was violently repressed by the police, eventually causing the death of Hassan Daouda Massing, a law student. His death led to a wave of rage that increased the intensity of the protests. This was further aggravated by short videos circulating on Facebook showing torture being inflicted on the arrested protesters by the police. A mobilization of the youth through SMS organized more protests on 10 March and again on 11 March, the day of the burial of Hassan Daouda Massing. Thinking about those young people tortured by Chadian police. This is what has been filmed. But just try to imagine how many suffered the same treatment without images to prove it. Just imagine that it is your son, your brother; just imagine that it is you. The relevance of an apparently trivial case in causing such a huge protest demonstrates that there is much more behind this protest and, notably, a sense of mistrust among the people and the perception of the state as an entity wanting to drain their resources. This was in fact only one of the many laws that were imposed without the adequate preparatory actions necessary for making a law an effective measure for improving the lives of citizens. The imposition of helmets was experienced as yet another way to extract money from the population. In fact, the announcement of the law led to serious consequences and abuses from the police. People caught without a helmet were arrested in the streets and fined by gendarmes and police without receiving any receipts for payments. In the meanwhile, helmet prices skyrocketed. A helmet that normally would not have cost more than 8,000 FCFA (about 12 €) came to cost up to 25,000 FCFA (38 €). Buying a cheap helmet in Kousseri, on the other side of the border with Cameroon, was forbidden. These prices hit students especially, who constitute 80 per cent of all motorbike users. Many students also pay for their study costs by driving a motorbike as a benskin, a moto-taxi. In this respect, the new measure seemed like a punishment instead of an aid. My contribution to help advance my beloved country Chad, which I adore so much. The title is: Je voudrais porter un casque [‘I would like to wear a helmet’]. His contribution to the protest against helmets delved into the very nature of the protest, showing that the protests were definitely more than just about helmets—they were in fact about far broader social issues, among which the helmet issue was just a mask. The doctor in me says that wearing a helmet is important for a moto driver. But I have to say that the measures for imposing it create more victims than driving accidents. Condolences to all those poor grieving families. This scenario of distrust and anger has not changed since the time of the helmet protests in 2015. Passing through the election time, which for many Chadians was identified with anger and frustration at non-transparent elections and the cutting of Internet and communication services, the anger and exasperation of people has intensified with the worsening of the crise financière. The severe delay and eventual suspension of salary payments to state employees resulted in massive strikes, and the students resumed their protests. During the whole month of September and part of October 2016, universities were closed and public services were seriously limited, while in the final months of 2016 other protests, in addition to those of the students, were prohibited. 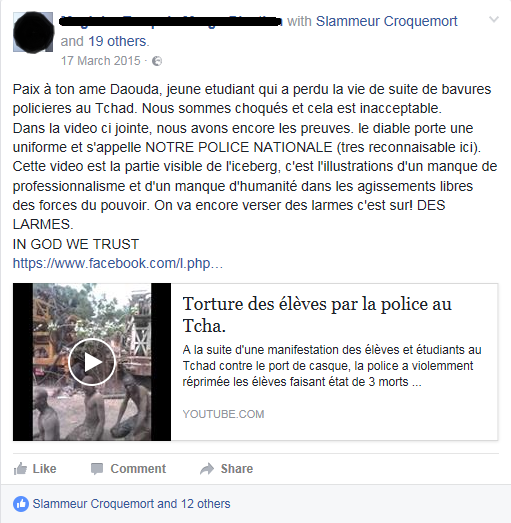 Students that choose to protest run high risks in Chad, as the arrests, show trials, and deaths sadly demonstrate. This is also aggravated by the fact that student protests can technically be prohibited by appealing to anti-terrorism laws. In these times of Boko Haram and suicide and other attacks, it seems the government explains everything undesirable that happens as a form of ‘terrorism’. The new law against terrorism clearly states that the government is permitted to arrest anybody who is involved in agitation against the state. Any demonstration or meeting can be interpreted as such, and arrests are permitted. As one of my colleagues at the university in N’Djaména explained, the government is afraid of these student and youth protests. ‘They have become a real force in society. You can be sure that students are the most intelligent people and are able to organize and reason. They should be heard and allowed to participate in a dialogue. 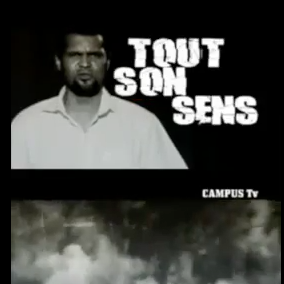 But this is not the Chadian way: oppression is the only answer.’ [Free translation of discussions with a Chadian colleague between September 2014 and February 2015].